This year the spectacular wheelchair basketball world championship took place in the Wilhelmsburger Inselpark Arena in Hamburg. In 96 enthralling games of the 16 men’s and 12 women’s teams, the Netherlands (women) and Great Britain (men) could celebrate themselves as world champions in the end. The sporting highlight from the German point of view was the success of the women’s team, which won the bronze medal in a thrilling little final! Not only the paralympic excellence of the athletes gave the spectators sufficient reason to celebrate: The successful event made a great contribution to the promotion of the acceptance of disabled sports and offered with the successful barrier-free implementation, as well as numerous inclusive program items off the court, an unforgettable experience for all parties. During the entire implementation, the 2018 wheelchair basketball gGmbH could rely on numerous volunteers and sponsors, who contributed to the great success of the event. What was needed was a system that made flexible and fast on-site issue of accreditation cards possible. In the area of ​​admission control and ID card issuing, it was necessary to avoid long queues. At the same time, the printing system should be as intuitive as possible, as the issue of access cards should be carried out by volunteers without the possibility of pre-technical technical training. In order to allow the security officer at the entry points an easy visual verification, the visibility of the accreditation accreditation should be created in a clearly visible XL format. In addition, corresponding ID card accessories in the form of lanyards were required in order to be able to wear the IDs directly and comfortably on the body. In the search for a suitable accreditation partner, the 2018 Wheelchair Basket Basketball gGmbH relied on the knowledge of a colleague who already had experience with accreditation systems at various sporting events. The fact that YouCard already presented itself as a solution provider for accreditations in the framework of the Paralympics in Rio and was a long time ticketing partner of the wheelchair basketball club RSV Lahn Dill, the decision was quickly found. 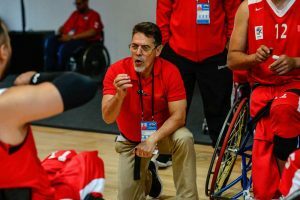 As a RSV partner, YouCard was particularly keen to sponsor the Wheelchair Basketball World Cup in their own country and thus contribute to a professional course of the event. „We were very pleased that YouCard wanted to accompany the Wheelchair Basketball Championships 2018 as the biggest disablility-sports event. For on-site personalization, it was decided to use 3 SCC-4000D large format card printers manufactured by SwiftColor. The accreditation printer impresses with incomparable printing speed in special badge format – so it was possible to respond quickly and flexibly to the need for ID cards. The inkjet technology of the printers provided high quality personalization results thanks to 1200 dpi print resolution. The CardPresso XXL with the possibility of database connection to an Access table was used as the card design software. The basis for a smooth process of accreditation during the event was provided by targeted preparatory work. Fundamental was the creation of a structured Access table, which contained the personalization data of volunteers, press, players and other officials. YouCard sent all components of the printing system, such as card printers and consumables, to Hamburg prior to the event. Thus, about half of the accreditation cards could be personalized and completed stress-free. This saved valuable resources and contributed significantly to the quick issue of the badges. The access cards were personalized and issued by volunteers of the 2018 wheelchair basketball gGmbH. Here 4 people in 2 shifts were daily in use. The accreditation phase ran to the full satisfaction of the 2018 World Cup wheelchair basketball gGmbH. The goal of achieving short waiting times at the dispensaries was achieved. The system was easy to handle and could be easily operated by the multitude of volunteers. Minor issues that occurred could be resolved directly by a YouCard technician who was on site throughout the World Cup. This included, for example, a cleaning of the card feeder. The all-round care, before and during the event, met with total satisfaction. During the preproduction YouCard accompanied the responsible persons by telephone and TeamViewer and supported the volunteers with all questions about the printer setup as well as the subsequent printing of the ID cards. YouCard proudly looks back on the sponsorship of the wheelchair basketball World Cup. The project was characterized by a pleasant, uncomplicated and professional cooperation and communication with the WM 2018 gGmbH. we always felt well advised and cared for. The accreditation solution, the manpower and know-how provided by YouCard were very well received by those responsible for the Wheelchair Basketball World Cup 2018 gGmbH. Product, service and support met with general satisfaction.